Chef Ben Wong's culinary journey began at the age of eight years old in his father's Hong Kong based restaurant. While his knowledge is strongly rooted in strong Chinese cultural traditions, he has also travelled extensively to learn techniques from other culinary backgrounds. From cooking in the family business he moved onto his first executive chef position in Hangzhou, China before spending ten years in London at Hakkasan Hanway Place. 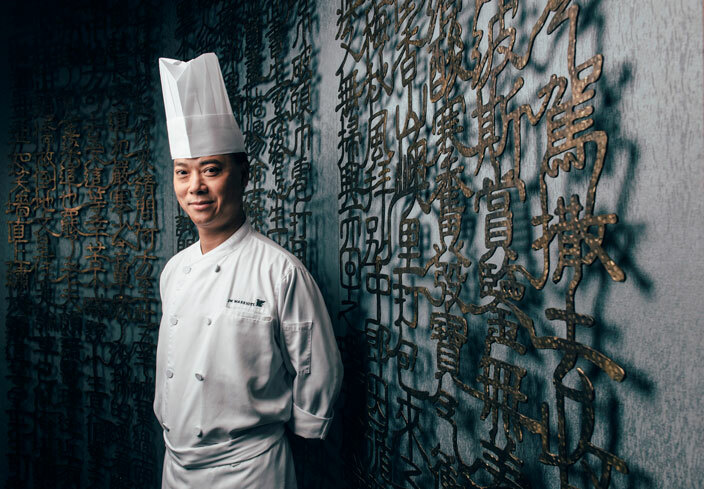 After returning to Asia, he joined the JW Marriot Macau’s Man Ho restaurant where he honors Cantonese cuisine’s long history while simultaneously flexing his creative muscles. That’s chatted with him about his culinary influences and picks for must-order dishes at Man Ho. You got your start cooking with your father. Can you tell us a bit more about your experience prior to Man Ho? I started my culinary training with my father, who operated a Chinese restaurant during my childhood, who encouraged me as he discovered my culinary potential. I was the chef at my father’s restaurant as a teenager. After I learned all the basic techniques and culinary skills, I started travelling to other countries as I was ambitious to learn different culinary culture overseas. There wouldn’t have been challenges or pressures if I had stayed at the same place. I would never have broadened my horizons or enriched my culinary skills without challenging myself. When I was 23, it was my first time as the main chef and I managed a team of over 90 people in Hang Zhou. Afterwards, I have traveled to Taiwan, Malaysia, France, Shenzhen and the U.K. When you cooked for heads of state (Former President Hu Jintao, Former Premier Wen Jiabao and Queen Elizabeth how was your food received? Did they have any favorite dishes? Since the owner of the restaurant where I was working at was the President of Chinatown in London, we usually served heads of state when they traveled to the country. One thing I found surprising was that rather than choosing precious dishes such as abalone, shark’s fin or bird’s nest, they usually preferred more traditional Chinese choices such as Braised Sea Cucumber with Scallion, Shanghai Juicy Meat Dumpling, rice noodles and congees. At this time, I developed my signture Crisp Duck Green Salad, which was inspired by the English culture as duck is a very popular food there. They really loved the food and had an enjoyable experience of traditional Chinese culture during their travel. How did you end up at Man Ho in Macau? I came back Hong Kong after I had been in the U.K. for over 10 years. Unfortunately my back was injured in the U.K. and I had to get this healed in Hong Kong. Afterwards, I joined Man Ho Chinese Restaurant at JW Marriott Hotel Macau as I wanted to continue experiencing different cultures and Man Ho has really given me the opportunity to develop more interesting cuisine as well as coach the younger generation. What would you say are the essential elements of Cantonese cuisine? Great Cantonese cuisine must be perfect in color, aroma and taste. As a chef who specializes in Cantonese cuisine, I always challenge myself to strike a balance on these three areas and serve the best dishes to my customers. On top of that, we have to control the level of heat when we cook in order to retain the taste and taste of the food, and use the appropriate cooking time. How has working in multiple countries affected your cooking style? It has definitely broadened my cooking style with a mixture of different cooking skills and the use of different ingredients. Every country has its signature dishes and style of cooking. The more countries I have worked in; the more varieties I have tried out when developing new dishes. My favorite is still Cantonese cuisine; no matter which country I’m in. What matters is how I play around to make Cantonese cuisine refreshing and special. Would you say your techniques are more traditional or innovative? Rather than defining myself on either side, I would say I am somewhere in between. We can’t neglect the traditional side especially then we are talking about Cantonese cuisine, which has a long history of time that’s valuable. at the same time, we can be innovative and mix and match. Let’s say I decide to book a flight and head to Man Ho for dinner, what are the must order dishes? I would certainly recommend the signature dish that I have already mentioned – Crispy Duck Green Salad. It was so popular when I first brought this dish to the restaurant in the U.K. and most restaurants in Chinatown now have their own variety of it. This dish is a mix of Chinese and Western styles, with the use of over 40 seasonings. It is modified from traditional crispy duck, which I fused this with the style of Peking Duck after deep frying. The refreshing taste is highlighted with added veggies while keeping a crispy mouthfeel. There isn’t a particular ingredient since Cantonese cuisine emphasizes the freshness of the ingredients. I usually stick closely to seasonal ingredients since they are the best. Afterwards, it is a question of how to project their freshness through different ways of cooking. What sets Man Ho apart from other Cantonese restaurants in Macau? The cuisines you can find in Man Ho are interpretations of my cooking philosophy, which is keeping the best traditions of Cantonese cuisine, but at the same time having a creative element. Our signature dishes can be found in other Cantonese restaurants, but we have different ways of cooking or use different ingredients. Our Honey Roasted Barbecued Pork, for example, is created with Spanish pork belly instead of traditional pork collar to highlight the texture of the pork, which is best matched with the sauce. At Man Ho you have a number of tea dishes. How important is tea at Man Ho? Finally, how does being based in Macau influence your cuisine? It is common to find quite a few old and traditional cuisines here in Macau. With the unique geographical location, people in Macau enjoy having fish such as sole fish. This has inspired me to use ingredients that are favorites of the Macau people, and to maintain a human touch in the way we serve customers. In line with the Japanese restaurant's esteemed culinary reputation, Chef Kondo Yosuke has now joined the team as Master Chef.